Incredible special effects and action really contribute to a smart and exciting movie. Dawn of the Planet of the Apes is a pretty cool movie. It’s a film that really brings the audience into the world of apes, where these creatures use sign language and also brief spurts of English dialogue to communicate with each other. The effects that give these creatures life are out of this world. And the story about one evil ape going rogue and turning on the others is pretty creative. 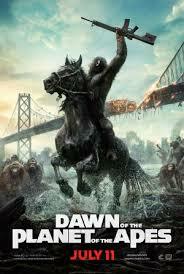 Dawn of the Planet of the Apes is interesting. It’s a movie that gets the perfect balance of screen time between humans and apes, making the apes slightly more of the main characters. The storyline here is pretty good, and the effects are hands down spectacular. This is the way a Planet of the Apes movie should be. The apes are all computer generated, like in the first movie of this current incarnation, Rise of the Planet of the Apes. Now, for years I’ve been against using computer generated images in place of live actors, makeup, and costumes, this is the movie that proves that notion wrong. At least for this type of movie. There are certain things that live actors just can’t do. Being apes is one of them. So the effects are fantastic. Nearly every scene features these apes and these effects, and while that’s great for a while, it also ends up leading to a bit of a problem. The problem with this overload of effects is that we get used to them after a while, and not as impressed. The result of all this is that the first half of the movie is fantastic, (it’s literally watching terrific, state of the art effects in every moment), but then for the second half we need something more. We really need either the story or the action to take over and grab our attention, because we are no longer fascinated by the effects. With a story about an uprising and attack that starts about halfway into the film, we get it. The plot of the movie is good, especially in the first half. And the second half is about the action. The movie starts out showing us these apes in the Mir woods forest, and the community that they have created for themselves. Caesar is in charge and his wife is just giving birth. There is also an encounter between the apes and a giant bear which leaves Caesar’s son scarred across his chest and introduces us to a great warrior ape, named Koba. For the first ten minutes or so, there are no humans on the screen. The apes talk using sign language and we get to see what they are saying via subtitles. They discuss humans and whether or not they are all gone. It’s been about ten years since these apes last saw any humans. Not long after that, we see the group of humans that remain and the colony they have created for themselves in some abandoned buildings. The leader, Dreyfus, is played by Gary Oldman, but he is hardly the human star of the film. 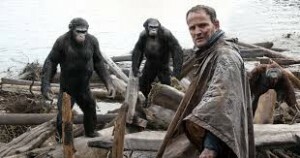 That character, Malcolm, is played by Jason Clarke (Zero Dark Thirty), and he’s the good guy of the humans, with Caesar representing the good guy of the apes. Clarke wants to bring some scientists and mechanics into an area of the Mir woods where the apes are. There’s a water dam there, which is connected to a power station. If they can get this station up and running, it might be enough to power their entire community. This is a necessity right now, because the humans are on the verge of running out of fuel in their community. We get a first encounter between Malcolm’s humans and the apes, where one of his men shoots one of the apes. Caesar has to intervene in order to prevent the other apes from killing these humans. He angrily lets them go and tells them not to come back. This passive action causes some tension among the apes. Koba begins the rumblings of an uprising, telling other apes that Caesar loves humans more than apes. Koba was one of the apes who was harshly treated by humans during scientific experiments (like we saw in the first movie,) and he does not like that Caesar so easily lets the humans go. Malcolm realizes that he and his team still have to get to that power station, and so even after the apes show up at the humans front door and tell them to stay out of the Mir woods, Malcolm goes back. He also manages to convince Caesar to let him and his team work on the power station. This is what leads us into the second half of the film, which is all about Koba’s uprising. This ape does some terrible things in order to get the others to follow him, and it’s all pretty cool. There’s great action here, but the only problem is that on occasion we are not sure who to root for. Are the apes who are fighting the humans bad, or have they just deceived by Koba into doing this? The movie tries to answer this question by having Koba lock up Caesars most loyal apes (allowing us to feel that the apes who are fighting are the bad ones,) but it’s still not made entirely clear. Other than that flaw, the action and story both work. There’s a cool moment where an ape drives a tank and we get to see it from the apes point of view, sitting on top of the tank with the ape. Ideas like this are pretty wild. If only the two opposing sides of apes were more distinct. This movie would have benefited from having Koba be in charge of a group of apes who were clearly the bad guys. If those apes had their own look to them, we could have gotten a lot more action where we knew which to side with. The first movie had that going for it. The action at the end of that film, on the Golden Gate Bridge was ferocious. In Dawn, the storyline might be a little better, but the action isn’t quite as good. Maybe that’s because the action runs throughout the movie whereas in the first film, it was mostly saved for the climactic finalie. Even still, this movie with all of it’s amazing and state of the art special effects, is pretty incredible.